My arrangement of “What Child is This“, commissioned by Jonathan Bautista and Nova Vocal Ensemble, will be performed Nova Vocal Ensemble’s holiday concert: Go Tell It on the Mountain: A Concert for Christmas.Nova will be premiering my arrangement, as well as world premieres by composers Saunder Choi and David Conley. Please come and join us for a festive evening of inspiring Christmas music! 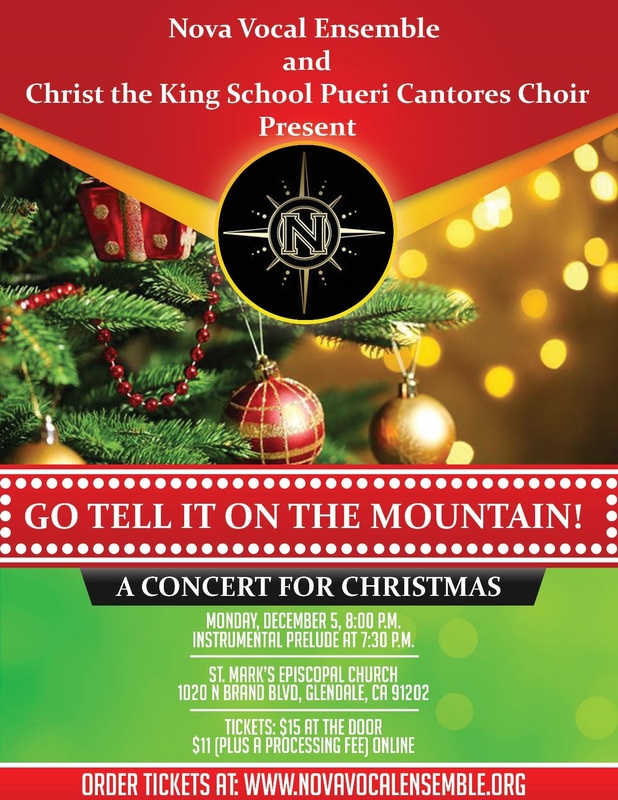 The concert is at 8:00pm on December 5th at St. Mark’ Episcopal Church in Glendale, CA. Tickets are $11 (plus a service fee). You can purchase tickets here. More event info on my shows page.